On the budget side of things, the new condition AmazonBasics Electronic Flash for DSLR Cameras is on sale for the very specific price of $22.75, with up to five per customer at the sale price, sold and shipped by Amazon itself. This is not a lightning deal, so the price does not have a visible ticking clock. It averages 4 out of 5 based on 280+ customer reviews and it has 165+ answered questions, so if you are curious about it, chances are, your questions about it may have already been answered. Also on the budget side of things at Amazon, the new condition Neewer 5 in 1 Portable Multi 40″x 60″/100 x 150CM Camera Lighting Reflector/Diffuser Kit with Carrying Case is on sale for the very specific price of $18.89. A new 3-day coupon promotion is running at KEH Camera. 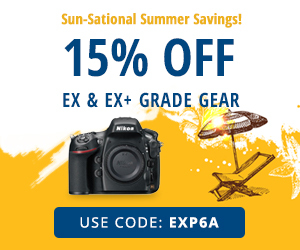 Good until Thursday 6/21/18 at 11:59pm eastern, coupon code EXP6A gets you 15% off used camera gear in the “EX” and “EX+” conditions. They come with a 180-day warranty from KEH and free shipping on orders of $49+. A total of 6499 items are eligible for this coupon as of the time of writing. You can use their various categories and sub-categories on the left hand side to filter by brands or mounts or product types of interest. The latest B&H Photo Daily Deals are here until Thursday at 11:59pm ET with free shipping regardless of price. One of the Thursday daily deals at the Amazonian Gold Box, good until 3am ET on Friday (or earlier if sold out) is the new condition Bushnell Legend Ultra HD Roof Prism Binocular going for $144 with free shipping in your choice of camo or black color scheme, with up to four pairs per customer. This is sold and shipped by Amazon itself. Speaking of Amazon, their new condition AmazonBasics Hardshell Spinner 20 inch luggage is on sale for $30 with free shipping with up to three per customer at the sale price. For carry-on usage, check dimensions with your airline(s) of interest as it looks like it is slightly larger than the 22 x 14 x 9 inches (per the product description it is 22 x 14.2 x 9.8 – check customer reviews and answered questions for more). In other daily deal action, at Woot, they are offering the new condition Yuneec Breeze 4K Indoor/Outdoor Camera Drone for $170 in the two battery bundle or $190 in the three battery bundle. Bundles come with controller. Sale ends Friday 1am ET or earlier if sold out.